MISSION, KS--(Marketwire - October 11, 2010) - (Family Features) Just because the weather is getting cooler doesn't mean you have to pack the grill away for the season. Fall is a perfect time to prepare a mouth-watering spread on the deck or in the backyard. And whether you're tailgating, having weekend guests or just craving the tastes and smells of the grill, Chili-Glazed Beef Ribs are a great dish for everyone. Sweet with brown sugar and molasses and spicy, with a little help from Tabasco sauce, these ribs will disappear lickity split! Brush ribs with 2 teaspoons Tabasco sauce. Place in large roasting pan. Cover tightly with foil; bake 1 1/2 hours. Meanwhile, in small saucepan, combine ketchup, molasses, vinegar, brown sugar, remaining 2 teaspoons Tabasco sauce and salt. Heat to a boil over high heat; reduce heat to low; simmer, uncovered about 5 minutes to blend flavors. Preheat grill to medium-low over indirect heat. 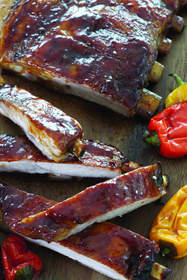 Brush ribs on both sides with sauce. Place ribs on grill; meat-side down. Cover and continue cooking 15 minutes. Turn ribs over; brush with more sauce. Cook 15 minutes longer, or until ribs are tender. Serve ribs with grilled bell peppers, if desired. Note: If you prefer, substitute one 4-pound slab pork spare ribs in place of beef ribs. Prepare as above.